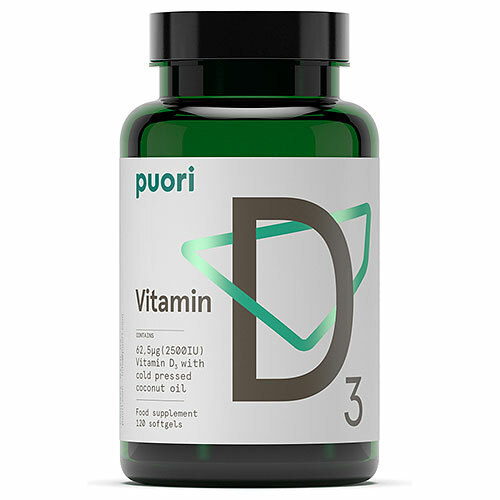 Puori D3 Vitamin D3 in a potent dose, dissolved in organic coconut oil for optimal absorption. Vitamin D helps to support normal absorption of calcium and phosphorus and to the maintenance of bones and teeth. Vitamin D also helps to support the maintenance of a normal immune system and muscle function. GMP Certified for premium quality. To ensure maximum absorption, only the highest quality cold pressed coconut oil is used. Coconut Oil, Bovine Gelatin, Humectant (Glycerin), Colour (Plain Caramel, Vitamin D3 (Cholecalciferol). For adults 11 years and up take 1 softgel daily, preferably with a meal or as recommended by a physician. Below are reviews of Puori D3 - Vitamin D3 - 120 Capsules by bodykind customers. If you have tried this product we'd love to hear what you think so please leave a review.